Hoping to continue their upward mobility, the WIlson Bruins visited the winless Jaguars. This is a three-part series, with Katie Rispoli writing Part I, and Brian Addison writing Parts II and III. It’s no secret that Americans have a love affair with food. Basically anything we can buy or eat, we will. But why? At this point we have been fixated on diet for long enough where it seems to be inherited. Evolutionary, even. Since the creation of modern fast food dining, families have eaten out of the home more and more frequently, as opposed to traditional household meals prepared in the kitchen and served at the table. Now, we seem to look back on times when family meals were highly valued as mysterious notions of the American past. To romanticize a point in time like this a couple of generations usually have to pass. This same generational gap towards appreciation applies to historic buildings. Twenty years after construction, an older building might just be perceived as outdated. It might be remodeled or demolished. At this point, we’re convinced most ‘90s architecture is pretty far from remarkable. Fifty years after? There’s usually some appreciation for a style, trend, or cultural moment in time. Give it a hundred years and—today at least—you’re thrown back to a building constructed before our major highways, when orange groves still existed in towns like Downey and San Bernardino. But the fifty-year period is key. This is not only the age at which we start to think something might be historically valuable, but it’s the age where it’s legally considered historically valuable. And if a building can be deemed significant for its age, can a movement? In the 1950s, the American fast food movement exploded. In 1994, not quite fifty years after the boom, the oldest operating McDonalds in Downey was proposed for demolition. After a grueling two-year battle, the LA Conservancy successfully convinced the corporate giant to retain the building and capitalize on its history. In-n-Out Disney-fied their original location complete with an old-timey van of their own free will and Walmart’s first storefront remains open to the public. Our consumerist habits have awoken a new beast in preservation focused on the fast food movement. My suspicion that it was on the cusp was confirmed in 2014 when Dunkin’ Donuts proposed demolition of the Daily Grind on 7th Street in Long Beach. Our beloved Giant Donut almost came down, but public opposition and an impending PR crisis convinced the company to keep the Mid-Century fast food relic and work it in to the new spot (kind of a no-brainer, but whatever). Now, after it all, the original Taco Bell is facing imminent demolition in Downey. And right on track, 53 years after it was built, we’re up in arms. The Downey Conservancy—full disclosure, I’m on their Board—has begun garnering public support to devise a plan against demolition of the structure. There are currently no plans for the site, but the former restaurant did move out of the space and it’s up for grabs (for conservation, hopefully not the landfill). Apparently, all of LA is crying foul. In the less-than 48 hours since the initial press release by the Downey Conservancy, the Downey Patriot’s average 200-400 views per post has been blown out of the water with 15,000 on the Taco Bell story. Taco Bell has issued public statements. Curbed and LAist have both come aboard announcing a crisis. Yeah, it’s fast food and we want to change perception about our eating habits. 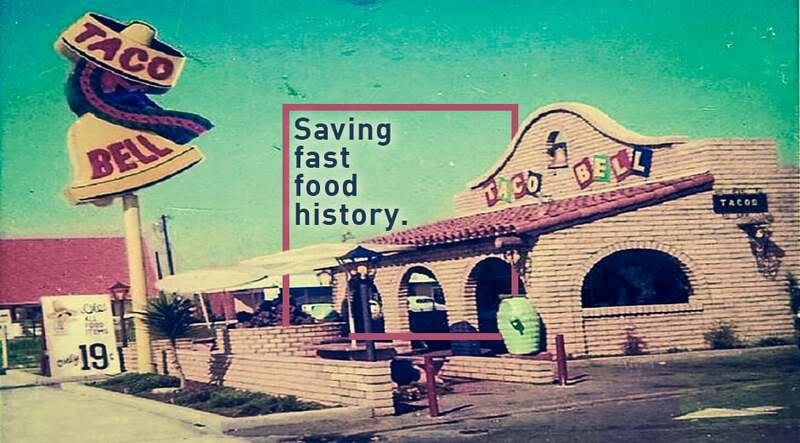 Maybe it doesn’t send the greatest message, but you can’t choose your past and ours has a steady trail of tacos for the last (delicious) fifty years. And okay, it may not be an architectural gem, but who says history has to be beautiful? So this brings me back to the why. Why do we explode with rage when McDonalds almost tears down the oldest-operating McDonalds while we sit idly by while Wyvernwood, home to Latino Los Angeles residents for generations, faces an ongoing demolition battle? Our kids are rewarded with Happy Meals, but aren’t too involved in community organizing. Why does a hovering mid-century donut garner 2,000 Facebook likes overnight and overflow City Council meetings while meetings that cover important issues like city budgets, pedestrian accessibility, and union concerns are only attended by small groups of organizers fighting for the issues? We condition our kids to crave tacos, but encourage the perspective that advocacy is futile. Why do we give a damn about the first Taco Bell while Long Beach is about to throw an entire Civic Center with incredible historic value in the dumpster? (Anyone following the 50-year pattern on our just-shy of 40-year development?) We train our kids to love tacos, but not local government. We have raised a generation of residents in this country who have fond childhood memories of burritos, and little knowledge of their communities. Thankfully this has changed to a degree. Children today are more educated about the environment and tend to have abundant opportunities to be involved in other ways. But in regard to our past, maybe if we were as focused on finding ways to get kids civically engaged as we are on taking them to the Playplace, we could see as much passion for the dozens of advocacy battles constantly facing LA County’s communities as we have seen come about with the fast food preservation movement.